Our most popular option, group classes are the best way to cover all your bases! These four to six-week courses meet for 50 minutes at the same time each week to complete a set agenda designed by our trainers. Worried about getting lost in the crowd? Don't be- we cap our classes at 7 students to make sure everyone gets the instruction they need. If your dog doesn't do well with other dogs, needs help with a specific behavior, or you just can't commit to a full six weeks, private lessons are the way to go! These one-on-one sessions give you the opportunity to work around your schedule while working on your dog's training. Whether you're competing for fun or for fame, Lucky Dog has you covered! 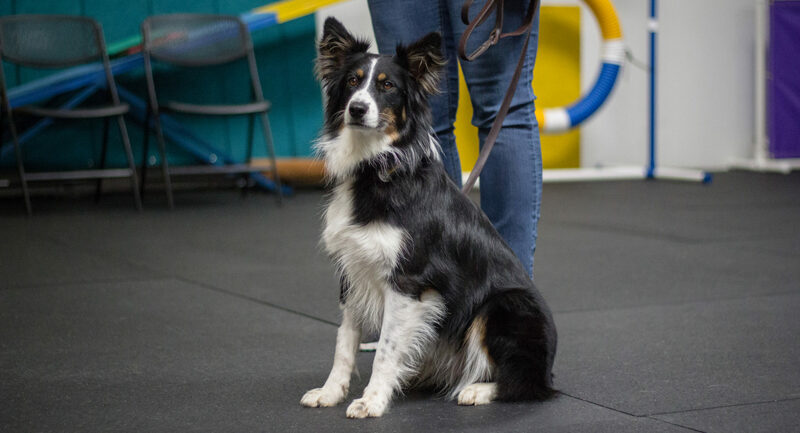 We train for agility, rally, and obedience in a fun environment that can take you from your first lesson to your final trial. Dogs don't speak human and we don't speak canine, so communication is essential to living with a furry family member. And that's really what training boils down to- teaching our dogs what we mean when we say things like "sit," "come," or "let go of my socks!" Dog training is a team effort- you're the captain, your dog is your teammate, and your Lucky Dog instructor is your coach. We're here to help you as much as possible, but it's ultimately up to you to build your team spirit! Whether your dog is destined to be an agility champion or the best behaved pooch on the block, it all starts with the basics! We focus heavily on making sure you have the building blocks you need right from the start. 4. And most importantly, Having Fun! When we say "positive training for positive people," we really do mean it! We do our best to make learning fun and exciting for people and their pooches. I am so bad about writing reviews but Lucky Dog Training Center definitely deserves the time for me to type one. I started out with puppy classes 2 years ago with my Beddy and along the way added agility classes for my mini Aussie. I now have 2 dogs in agility classes and we have started to compete in trials. Melinda is a super great trainer and is great with her furry clients as well as their people. She is very knowledgable, patient, and always goes above and beyond guiding her clients so we are successful. She has also pulled in some additional trainers and we have recently started working with Dresden. She brings different strategies and perspectives for agility training. I feel like between the 2 trainers we will learn and grow so much more, as a team. If you have a puppy or older dog that is in need of some training or you are interested in doing something fun with your furry companion, I highly recommend giving Lucky Dog a try. I promise you will not be disappointed! My daughter and I have now taken the Manners 1 and Manners 2 courses with our dog Colt. He loves it. Colt was pretty well-behaved before taking classes, but we still learned lots of “little things” that are easy to implement and make living with a dog so much easier. We’ve seen improvement at home and have also seen remarkable improvement in the other dogs that come to class. Highly recommend. We have been using Lucky Dog Training since February 2015. That is when we brought our Australian Shepard Puppy home. Before Nemo was able to go to group class we took private lessons from the owner Melinda. Since that time we have been enrolled in a class almost continuously. We are now in Agility class and hope to start competing soon. None of this would be possible without the expertise and patience of Melinda and her staff. In particular Dresden Graff, who clearly loves dogs and can clearly articulate how to achieve the desired behavior. Nemo has gone from a energetic sometimes out of control, noisy ball of fluff to a handsome intact male Aussie. He has good manners and we take him everywhere. He is confident in Agility and has learned to lay quietly ( mostly) in his crate and wait his turn, something i once thought impossible. I can’t imagine a sweeter, more well behaved dog and it all due to his training at Lucky Dog and our training there also. If you want to enjoy your dog, this is the place to start. Wonderful facilityy and wonderful trainers. We're excited to work with you! View our schedule and attend an orientation and let the fun begin!